The Middletown Regional Airport hosted the MidUSA Ohio Challenge this past weekend. We believe the crowd to be one of the largest ever in the history of the event. The Challenge was a resounding success with 40 hot air balloon pilots competing. Nicholas Donner of Fisherville, KY won the challenge by accumulating 3,850 points out of a possible 4,000. Points are earned by completing skilled tasks such as flying over a small target at the airport after taking off miles away from the target. 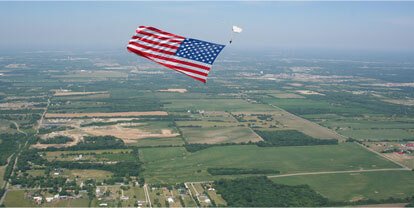 Team Fastrax completed a 10 flag skydive Saturday evening with the largest flag ever to be used in a skydiving event. They will repeat this jump in New York City later this year to commemorate the 9/11 terrorist attacks. This is a great event showcasing the talents of our city, i.e. Team Fastrax, HigherGround Helicopter School, the skilled balloon pilots, the airport and Smith Park. Congratulations to the MidUSA Ohio Challenge Committee for a job well done!